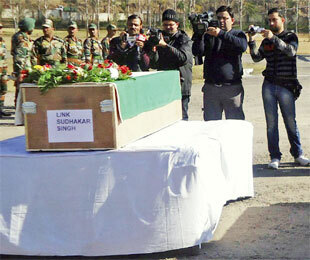 Srinagar, Jan 8: Two Indian soldiers were today killed by Pakistani troops in the Mendhar sector of Jammu and Kashmir. The attackers who intruded nearly 600 metres inside Indian territory are said to have snatched the duo's service rifles. Reports say the two soldiers were beheaded but the Army spokesman only confirmed that "one body has been badly mutilated." The incident was preceded by a prolonged firefight between the two sides. Incidentally, this is the second ceasefire violation by Pakistan in the last three days. On Jan 6, the Army was forced to retaliate after mortal shells fired from across the Line of Control damaged the home of a civilian. The Pakistani troops "initiated unprovoked firing," Colonel Brijesh Pandey said, adding, "it was clearly an attempt on their part to facilitate infiltration of militants." However, Islamabad claimed that a Pakistani soldier was killed when Indian troops "physically raided a check post named Sawan Patra" near the Haji Pir Pass on Jan 6. The Army dismissed this charge. Colonel Jagadish Dahiya stressed that "None of our troops crossed the Line of Control." The current ceasefire in Jammu and Kashmir came into effect in 2003. India has charged Pakistan with violating it whenever there is a major infiltration along the LoC. Delhi believes Islamabad deliberately creates trouble in order to divert attention so that militants can sneak in without hindrance. Pakistan's refusal to accept Kashmir's accession to India (in Oct 1947) is the root of the problem. Due to this, both sides had to deploy a large number of troops in terrain that is mostly inhospitable. The deep-rooted hostility between India and Pakistan means that the Siachen glacier continues to be the highest battleground in the world. Last month, an avalanche in the glacier's Turtuk area claimed six lives. All the deceased belonged to the 1-ASSAM Regiment. As many as 144 Pakistanis including 14 civilians were similarly buried under a wall of snow on Apr 7, 2012.